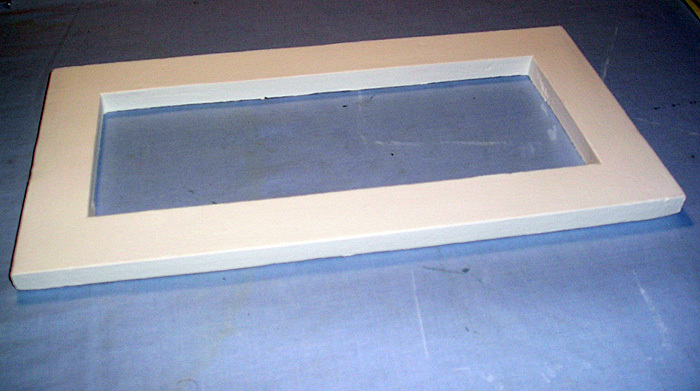 Molds for glass slumping can get a bit expensive and a bit limiting in just what you can do. 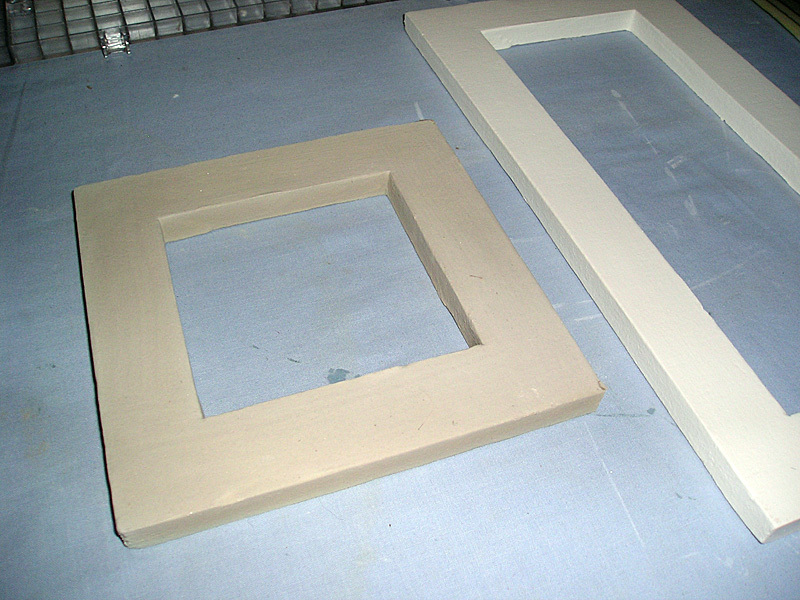 You can, of course, make you own molds using plaster, clay and fibre products such as board and mat. The fibreboard product seemed to me to be a good alternative at a reasonable price. Looking at a few videos and tutorials it didn’t look that hard to do, but I found the information a bit sketchy. Not to be deterred I decided to buy some fibreboard and give it a go. The information I found on the internet suggested a number of ways to proceed. Some said I had to burn the board out first, then coat it with kiln wash. Others suggested coating with kiln wash first and then burning it out. A few suggested using a hardener. It all got a little confusing. After talking to a local expert he advised that he simply coats it with kiln wash, lets it dry and then fires it to burn out the organic matter and prepare the kiln wash. Taking a square piece of board I divided it into halves, then divided one of those halves into half again. This gave me one long piece and 2 small square pieces. Using a Stanley knife I then carefully cut out the centres of the pieces. I then coated these pieces with several coats of Primo standard kiln wash, being sure not to soak them too much and dry each coat before applying the next. After applying 6 coats I fired them to 90 c for 20 minutes, with the kiln lid slightly open to vent, to make sure they were well and truly dry. I was advised to keep it below the boiling point of water so it didn’t create steam and blow pieces off the mold. The venting is to allow the release of moisture. Once that was completed I then fired it to the temperature specified by the manufacturer of the kiln wash, still with the lid vented. All went well, but there are a few things to take note of. I can tell you, when you do this you really need to vent your kiln as it stinks bad and quite a lot of smoke is released. Set up a fan if you can to blow the smoke directly out a window or door. You may want to leave the room as well. The other bit of advice is to not place them directly on your kiln shelf. The smoke discoloured my kiln shelf quite a lot. I am hoping this won’t affect anything in the future, such as adding a haze to glass pieces. I will be placing the molds on shelf paper in future. My only concern with this process is that the smoke from burning off the organic matter doesn’t affect the kiln in any way. In the photos you can see the end result. The larger mold is lighter in colour because I did a test slump and it has been heated to slumping temperatures. I am looking forward to slumping something serious in the mold. If it all works well I can see that by using fibreboard the possibilities are huge. With just a few pieces of carefully laid pieces I can make a wide range of different molds. My imagination is running wild.